My biceps and IT bands were burning just few hundred yards into the Hudson River. ‘Maybe it’s a good thing the Hy-Vee Tri swim was cancelled after all,’ I thought. Of course, I wouldn’t wish the horrible devastation recently wrought on The Hawkeye State on my worst enemy, let alone my mush beloved home state. My immediate friends and family in Des Moines, Cedar Rapids, and Waterloo are all well enough under the circumstances. But the news, photos and video of places like the Five Seasons Center in Cedar Rapids or Simon Estes Riverfront Amphitheater in Des Moines underwater have been shocking, and saddening. Obviously, then, I bit my tongue when the news broke that the Hy-Vee Tri swim was cancelled. For the most part. “Are you bummed it’s going to be a dry tri?” a friend emailed me from Indianola. This coming from a guy that hadn’t swam a mile since last year’s New York City Triathlon. Until yesterday. 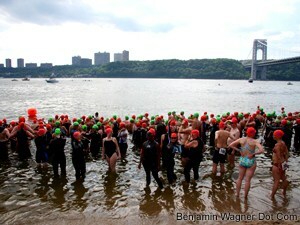 The Park-To-Park Swim is one of the Manhattan Island Foundations’ dozen or so New York City-centric open water events. Every indication is that the river is as clean or cleaner than any body of water in the country. I’ve done a bunch of swims here with no visible growths, lesions or weeping sores. Most have been along the West Side, though my favorite is The Brooklyn Bridge Swim every September. Imagine swimming from Wall Street to Dumbo under the historic bridge. It’s awesome. So too was the prospect of swimming in the shadow of the George Washington Bridge, way up there at 165th Street. Which, combined with the desire for some last-minute training, is what motivated my registration for the event. Thing is, I was already registered for a New York Road Runner’s Club Father’s Day Five Miler. So I decided to do both, with a fifteen mile bike ride in between. Manhattan Island Foundation events feel much more intimate a grass roots than most other events in which I compete. Yesterday’s was no different. There were just 250 swimmers, plus a few volunteers. An archway of blue and yellow.helium balloons marked the start. The race director gave instruction on a bullhorn. And we were off. I started out the outside of the pack, despite the fact that it put me a few dozen feet further from the turnaround buoy downstream. I took a few feet to my forehead, and brushed past a few torsos, but in general, relished the great, glistening George Washington Bridge and palisades beyond the edge of my goggles every time I took a breath. Five minutes in, though, I couldn’t figure out why it hadn’t receded into the background yet. Ten minutes in, I switched to breast stroke to secure my wedding ring (note to self: don’t swim in the Hudson River with your wedding ring), looked downstream and wondered, ‘Where the hell are those buoys?’ Twenty minutes in, I was still telling myself to relax, settle into the swim, and worry about the buoys when they made themselves apparent. Twenty five minutes in, boat horns began to sound over the sound of my arms and legs. Kayaks began corralling us back towards shore. I didn’t know what was going on, but didn’t want to be the last one to shore, so I turned on the afterburners and dug in. Back on dry ground, I high-fived my nephew, Ethan, and slipped my medal around his neck. While I heard no official announcement, it became clear from the prattle around me that the incoming tide (the Hudson meets the Atlantic just a few thousand yards downstream) had proven stronger than anticipated, thus the race was called. No swimmers — not even the elites — had made it as far as the turnaround buoy. Indeed, many of the weaker swimmers had to be hauled aboard boats from as far north as the GWB itself (so I wasn’t even close to the last person ashore). Rivers are powerful, awe-inspiring things.